The Cox Enterprises Gardens, by HGOR, Atlanta, Georgia, USA. 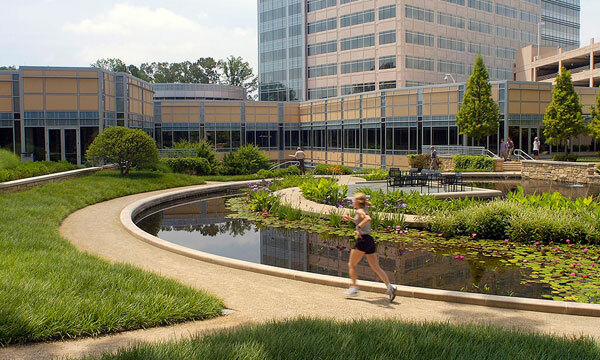 While some people may have to commute after work hours to access outdoor green areas, others are already benefitting from the integration of their offices with green space. 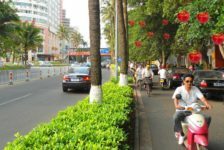 The park-like gardens in the surroundings of some business buildings are attractive spaces, but they have a high initial investment, which discourages their creation. 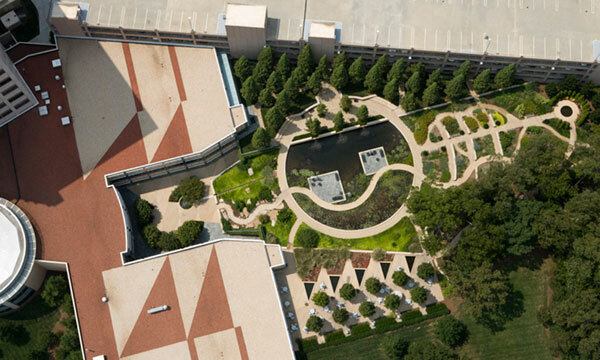 However, some very successful cases — such as the Cox Enterprises Gardens — may encourage other companies to adhere to this practice, benefitting not only the workers that will use the gardens, but also the neighborhoods that will share a healthier and more aesthetic environment. 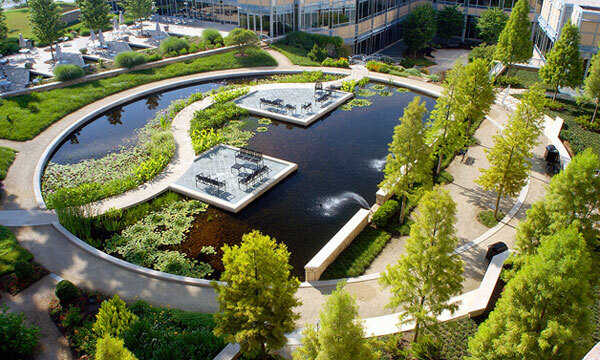 When the HGOR design team was chosen to plan Cox Enterprises’ new headquarters in the Dunwoody neighborhood of Atlanta, Georgia, they envisioned a landscape that could be identified with the company’s dynamism, in addition to enabling the workers to practice outdoor activities. 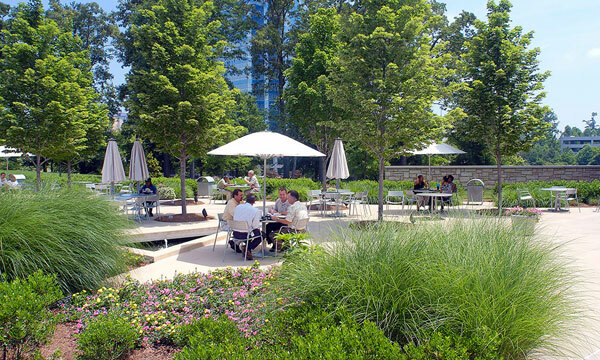 In recognition of its outstanding characteristics, the project received the Honour Award from the Georgia Chapter of the American Society of Landscape Architects in 2008, bringing to public attention the issue of how to transform office campus designs, where most of us spend considerable parts of our lives, into more attractive spaces. The designers created an outdoor space inspired by traditional geometric forms and with the flexibility of contemporary aesthetics. This combination of formal shapes and free lines resulted in a dynamic composition featuring the circular pond as its central component. As a mirror, the water surface reflects the surrounding environment and works as the focal point where all the elements converge. In this space, integration was preferred over symmetry, but this dissonance with the classic rules did not compromise the balance of the composition since the plants, furniture, and hardscape elements were harmoniously organized. They were placed to define sectors that are not strictly separate so that the pathways, seating area, and ribbons of trees cross the limits of the circle, enabling a more dynamic interaction with the different components of the gardens. 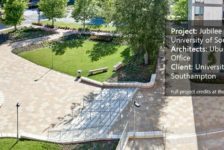 A multifunctional outdoor space The intersection of formal shapes and curved lines defines unconventional spaces, enabling diverse experiences throughout the entire office campus design. Along the main axis, the curvilinear pathway sets leisure as the theme of the space, inviting people to take their time to enjoy the outdoors. 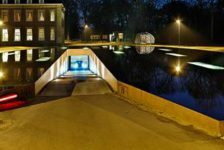 The stillness of the water circle inspires a relaxing walk in its surrounding way or in the winding pathway that crosses it, with pauses for resting in the seating area inside the circle. 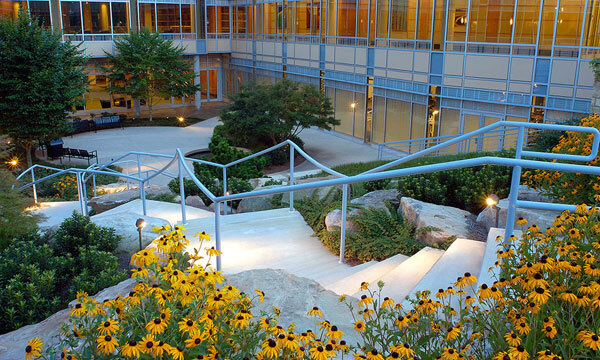 The walkways are also used for exercising, contributing to a healthier lifestyle in the work environment. Although it’s becoming more common for companies to include fitness centers in their buildings, initiatives such as Cox Enterprises’ produce more benefits. Exercising outdoors with views of nature is stimulating, so people feel happier and, consequently, more productive. Outdoor social gatherings also have a special area that was designed in a patio style, with table-and-chairs sets placed under umbrellas, where people can comfortably meet during breaks or after work. 10 Practices Showing That “Sustainability” is More Than Just a Buzzword! 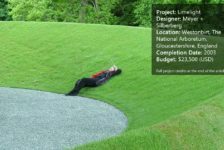 Landscape Architecture Corollaries – Try This.